Birds are a beneficial part of the wildlife in our gardens but they do have a few habits that can require some action on our behalves. Fruit is an important part of the natural diet of many birds that play an essential role in the dispersing the seed of many berry, pip and stone fruits in the wild. When we grow fruit in our gardens we create a natural attraction to many birds as a result. Birds are also keen on fresh young seed-pods and succulent growing tips of a wide range of plants. They are also inquisitive and spend a lot of time turning over leaf debris and rooting about in the soil as they look for food. Birds are important predators of a number of common garden pests from slugs and snails to aphids and caterpillars. We don’t want to exclude them entirely from our gardens but may want to keep them off certain of our valued crops. Protection:Plants that are vulnerable to feeding birds can be covered with mesh when seedlings are young or as fruit starts to ripen. Erecting a walk-in fruit cage means you can grow a large crop of soft or berry fruits and give yourself easy access. Fruit trees can be covered with mesh where a crop is particularly vulnerable. Deterrent: Bright coloured shiny objects such as tin foil and old cds can be threaded onto strings and strung around crops such as peas and corn. This can help to dissuade pigeons from helping themselves. Whole trees can be festooned with lengths of metallic foil bird tape that glitters and rattles. 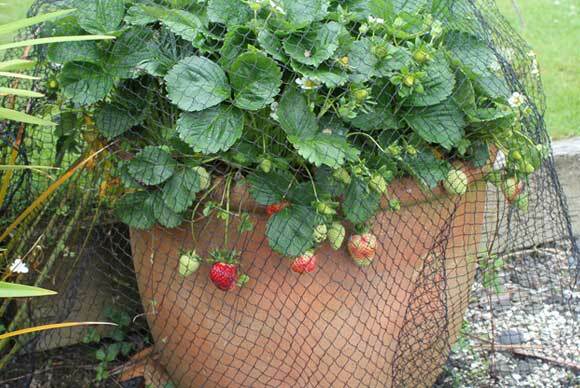 Pay-off: Late in summer and during autumn when your harvest is mostly collected take away mesh and deterrents and allow birds to do a tidy up for you. Keeping birds interested in your garden at this time of year means they are likely to stick around during winter and hopefully consume their fair share of pests such as slug and snails – and their eggs. Planting: Plant trees and shrubs as an alternative source of food for birds so they can be distracted away from your cherished plants. Allow some of your plants to be sacrificed for birds and leave a few to set seed in autumn as extra food. Plants such as: Crab apple, Cotoneaster, Flowering currant, Roses, Sunflower, Tree fuchsia, Wineberry.